Background: In 1688 the growing crisis caused by James II, a Roman Catholic sovereign over the church of England, came to a head. James II, alongside his catholic clients, were using Indulgences granted to religious Dissent to divide Churchmen from their Presbyterian and Independent counterparts. Meanwhile, James was busy advancing the Papal Interest. However, seven Anglican bishops, galvanized by the political networks of London clergy, refused to read the King’s Declaration (an unusual request on the Crown. Normally, reading of injunctions were left to the lower clergy not Bishops). Instead, the Seven took opportunity to petition James II, explaining their intention to protect England’s constitution while uniting Protestant Dissent to the established Church. Of course, the Bishops were arrested, but their speedy trial ended with their declared innocence and subsequent release into jubilant crowds. The Petition became a high water mark for national Protestantism, resolved to halt the Romanist party and the Arbitrary Power of James II. The humble Petition of William Archbishop of Canterbury, and the divers of the suffragan Bishops of that Province (now present with him), in behalf of themselves and others of their absent brethren and the Clergy of their respective Dioceses. Humbly showeth; That the great averseness they find in themselves to the distributing and publishing in all their churches your majesty’s late Declaration for Liberty of Conscience, proceedeth neither from any want of duty and obedience to your majesty (our holy mother the Church of England being both in her principles and in her constant practice unquestionably loyal; and having, to her great honour, been more than once publicly acknowledged to be so by your gracious majesty), nor yet from any want of due tenderness to Dissenters, in relation to whom they are willing to come to such a temper, as shall be thought fit, when that matter shall be considered and settled in Parliament and Convocation; but amongst many other considerations, from this especially, because that Declaration is founded upon such a Dispensing power, as hath been often declared illegal in parliament, and in particular in the years 1662 and 1672, and the beginning of your majesty’s reign; and is a matter of so great moment and consequence to the whole nation, both in Church and State, that your Petitioners cannot in prudence, honor or conscience so far make themselves parties to it, as the distribution of it all over the nation, the solemn publication of it once and again, even in God’s house, and in the time of divine service, must amount to, in common and reasonably construction. These same Bishops then launched a plan of comprehension in order to maintain a united front with English Protestants against Roman Catholicism. While in the Tower, the Bishops were visited by ten non-conformist ministers, with whom they began some preliminary talks, later continuing these conversations under royal commission. Ironically, among the bishops who advanced the scheme to invite moderate Presbyterians and some Independents into the Publik Establishment was Archbishop William Sancroft. Sancroft, the designer of the Petition, and at least five out of seven petitioners– including Turner, Lake, White, and Lloyd– initially engaged this limited review of church standards for the sake of an alliance with Dissenters. However, what makes the Petitioners’ participation unusual was that these same men later composed the root of the English Jacobitism. The tenderness to Dissent tends to break the stereotype of Anglican nonjurors, and maybe the point ought to be the differences between the early stock of non-swearing versus their later generation. “The scheme was laid out, and the several parts of it were committed, not only with the approbation, but by the direction of that great prelate [Sancroft], to such of our divines as were thought most worthy to be intrusted with it… The design was in short, this: to improve, and if possible, amend our discipline; to review and enlarge our Liturgy by correcting some things, by adding others and, if it should be thought advisable by authority, when this matter should be legally considered, first in Convocation, then in Parliament, by omitting some few ceremonies which are allowed to be indifferent in their usage, so as not to make them of necessity binding on those who had conscientous scruples respecting them, till they should be able to overcome either their weaknesses or their prejudices respecting them, and be willing to comply”. “In February Morrice had bemoaned the size of the Tory minority on the abdication question. In March, on the religious question, the two sides were, in the words of Sir John Reresby, ‘almost equally matched, and sometimes one carried a vote in both houses, and sometimes the other’. On 14th March the comprehension and indulgence Bills received their second reading; two days later we hear of the Devil’s Tavern Club, so named from the fact the Devil Tavern was the meeting place of a large number of members of Parliament, not confined to Tories, but all pledged to the Church of England. Reresby’s remark was ‘indeed it was high time for her sons to exert themselves’.” p. 247 From Unity to Uniformity. The second blow to unity was likely Nottingham’s introduction of the Toleration Act thereby legalizing rival communions. The latter was not a high church proposal, and even latitudinarians like Stillingfleet and Sharp generally disliked granting Indulgences to non-conformists as it weakened the position of the national church. Together, these factors created a growing fear that the church was imminently threatened by historical Dissent under William not so much Papacy by James. Hence, by the middle of 1689 comprehension was essentially dead. Adding fuel to the fire was a second, more radical version of comprehension proposed by Independents. By this time, Tories accepted Toleration as the lesser to two evils, dropping all versions of Comprehension. “…the substitution of William and Mary as King and Queen for James II involved the Archbishop and others of his brethren in the delicate conflict of conscience, which forbade them to take an oath of allegiance to the new sovereigns. When, therefore, the ecclesiastical aspects of the Revolution settlement came under consideration and the question of comprehension was again raised, the secession of the non-juroring prelates and clergy fatally weakened the Church at a moment when authoritative and firm leadership was essential.” p. 147-148 A History of the Ecumenical Movement. “Their defection had profound consequences not only for the Church of England but for English Christianity more generally. For it is possible (to believe the spin later put on these events) that if they, and Sancroft in particular, had stayed on board, playing an active role in Parliament and Convocation, the revolution settlement would not have merely tolerated Protestant Dissent but would have accommodated the more moderate Dissenters, especially the Presbyterians, within a more broadly defined national Church. 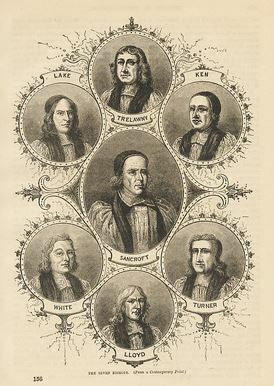 That was implicit in the greater measure of latitude and ‘tenderness’ which Sancroft’s Church, assisted by more moderate churchmen and some of the leading Dissenters themselves, had improvised at the time of the trial of the Seven Bishops. The failure of the 1689 comprehension, the indirect rather than direct result of the non-juroring schism, determined that from henceforth the Church of England, while remaining uniquely privileged and established, would forfeit the status of a truly national church…” p. 193 from_Cranmer to Sancroft. Obviously, Collinson is pretty harsh with Sancroft, laying blame for much of the church question on Sancroft’s lap. Evidently, Sancroft was chosen to the Lordship of Canterbury for his queit academic personality vis-a-vis candidates like Bishop Compton or the impression of older Archbishops, like Sheldon, who more often troubled Stuarts. “The full import of the withdrawal of Sancroft and his Non-juroring brethren from all participation in the ecclesiastical measures of the Revolution settlement became evident, however, in the proceedings of the Royal Commission appointed to prepare the comprehension scheme for consideration of Convocation and Parliament. Not only did their absence deprive the commission of its natural and authoritative leadership, but it also encouraged several of the members in turn to dissociate themselves from business… The fatal weakness, however, lay in the absence of Sancroft, and to a lesser degree of Lampulgh of York. The latter indeed was important solely officii virtue; but Sancroft’s defection together with that of his fellow non-juroring bishops inflicted a mortal wound on the commission and its proceedings. It was the heaviest blow to befall the church that, when presented with a second chance to revise its liturgy and canons and to repair the omissions of the Restoration, the indispensable leadership and authority were lacking. From this standpoint the non-juroring secession was a disaster difficult to exaggerate and overestimate.” p. 87-8. From Sheldon to Secker. “The bishops were here on their proper ground, and it was hard to dislodge them from it by argument. This seems to have been clearly perceived by the new Government, which showed considerable forebearance, and made various attempts to conciliate the recalcitrants. The sees were kept vacant for some time in order that the late Non-juroring holders might be won over.” ibid. There is some disagreement by scholars over Sancroft’s genuine enthusiasm for the project. Generally, high churchmen virulently opposed any change to the BCP. This wasn’t absolutely true, and among high churchmen there was a spectrum of opinion. Even staunch Anglicans like Bp. George Morley (a Laudian of his time in the diocese of Worcester) who actively killed a comprehension plan in 1674 under Charles II was willing to accept minimal changes. Indeed, comprehension was usually judged preferable over Toleration. “That they (clergy) also walk in wisdom towards those that are not of our communion; and if there be in their parishes any such, that they neglect not to confer with them in a spirit of meekness, seeking by all good ways and means to gain and win them over to our communion; more especially that they have a very tender regard to our brethern the protestant Dissenters; that upon occasion, offered they visit them at their own homes, and receive them kindly at their own, and treat them fairly wherever they meet them; persuading them (if it may be) to a full compliance with our church, or at least whereto we have already attained, we may all walk by the same rule and mind the same thing. And in order hereunto that they take all opportunities to assuring and convincing them, that the Bishops of this church are really and sincerely irreconcilable enemies to the errors…of the Church of Rome…and that they warmly and most affectionately exhort them to join with us in daily fervent prayer to the God of peace, for the universal union of all reformed Churches both at home and abroad against our common enemies; that all they who do confess thy Holy Name of our Dead Lord, and do agree in the truth of his holy word, may also meet in one communion, and live in perfect unity and peace together. ” Pastoral Letter 27 July 1688. Nonetheless, Sancroft was renowned for his translations. During his tenure, Sancroft translated to English, likely for the sake of mass consumption, both Filmer’s Patriarcha and Overall’s Convocation, texts which advocated passive obedience to the Stuarts. However, the irony of the Convocation book was it simultaneously decreed, under Overall’s heading of ‘Canon XXVII’, that a de jure King might be replaced by one de facto given the passage of time as a verdict of Providence. “The Presbyterian leaders had preferred comprehension to an indulgence shared with Roman Catholics from a Roman Catholic King [James II] intent on the promotion of his own religion. But under a Calvinist King intent they were sure of toleration, and hopeful of changes in the Test and Corporation Acts that would enable them to take office without conforming to the Church of England. The scottish presbyterians were already planning to use the revolutionary crisis to establish Presbyterian government in Scotland. In Ireland, where the destiny of the three kingdoms was most likely to be decided on the fields of battle, Ulster, where the Protestants were in the main Presbyterians, alone afforded a bridgehead for the revolutionary cause against the Roman Catholic and Jacobite south; there the Anglican ascendancy was likely to be overwhelmed now that James had lost his motives for restraint in the employment of Irish Roman Catholics. The English and Scottish presbyterians were strongly represented among the returned exiles who had come from Holland in the Prince of Orange’s army. The prospects of the Presbyterian [rather than Protestant] interest were sufficiently bright to make them think of command rather than compromise.” High Church Party, p. 28-29. Ironically, the success of comprehension depended upon the looming persistence of James II’s catholicism. Once it became clear William had no intention on securing Regency, or otherwise negotiating a settlement with James II, the specter of Papist reaction evaporated, and churchmen lost their brokerage. The grasping of Dissenters upon the occasion of William’s invasion further alienated the high church party. Sancroft likely concluded the impossibility of concord in such a situation, so quietly withdrew himself. “it is most evident, that the greatest number of non-jurors, if not all of them, would have come into a Regency; and then, I say, would have been settled by Methods as irregular in point of form, and the thing itself when settled, would have been less known to our Constitution, than the establishment which at last was fixed upon. The same objections might certainly have been made to one, which are made to another, from the Notions of Allegiance, and Nonresistance” p. 106. In retrospect, a Regency kept by William III would have had more success and better secured the project of modest comprehension, keeping high churchmen together by satisfying their scruples about Allegiance while Dissenters would have been more compelled to cooperate with Churchmen given the sovereignty was still Stuart with the menace of France. When consensus broke down, Independency won against the National Church. I hope this essay gives meditation to better comfort and reconcile us to the contributions of New England Episcopalians, or the American high church party under Seabury, as not altogether alien to currents in the Mid-Atlantic states sometimes dubbed “latitude”. But, by the time of the American Revolution, “latitude” could mean several things so we must be careful to identify it by a continuity with the Williamite bench, namely, moderate high churchmen. Perhaps these close relations may clarify the basis of the American settlement, 1785-1801. ¹This is something of a proof for constitutional monarchy as effected by the Restoration Settlement. ² Of the 39 articles, the doctrines of grace, the Lord’s Supper, and Trinitarian creeds were sacrosanct. Dissenting exceptions usually hung on Discipline rather than Doctrine, oftentimes the relationship of Bishop to his presbyters. If dealing with Baptists, then, of course, the christening of infants was a troubled point. But most orthodox latitudinarians were not interested in going so far with unity, loosening the terms of subscription instead of the textual content of the Articles themselves. Allegedly, the former was Sancroft’s preference (see Every, p. 42). Comprehension and Toleration were expected to work together. The former intended to unite moderate Dissent to the Church while the latter expelled radicals by granting them a regulated Independency. Very interesting Charles, it’s good to see you writing again! Very good to see a new post. My mother-in-law gave me a break from the kids while my wife was taking care of the newborn. Thanks guys! Would Bishop Cummins and his creation of the REC be seen as an extension of this failed attempt at a comprehensive church? Somewhat… however, the Cummins’ Declaration goes further than Tillotson’s proposals whether judged from the Restoration or Revolution period.